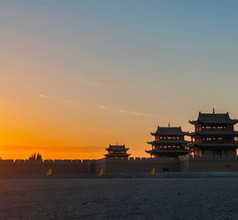 Jiayuguan City is located in Gansu Province of China in what is popularly known as the Hexi Corridor. Therefore, the city is surrounded by densely forested mountains, fertile agricultural lands, and picturesque water bodies. 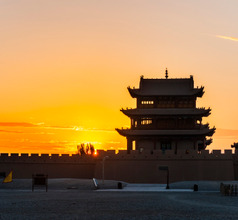 The most well-known landmark of the city is the Jiayuguan Pass of the Great Wall of China located on the outskirts of the city. 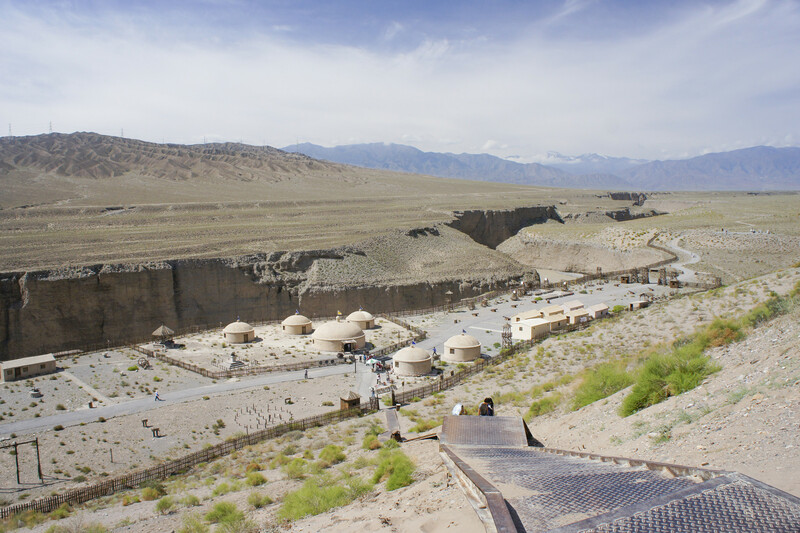 The city was the starting point of the ancient Silk Route from the western direction and was a bustling commercial hub even in those times. Today, the city is a popular tourist destination due to its excellent geographical features, rich history, and diverse culture. 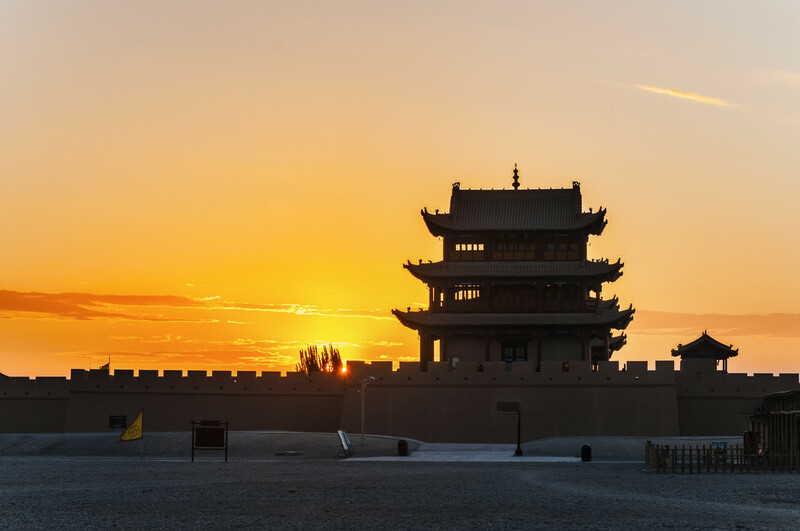 The Jiayuguan Pass was an army cantonment during the Qin Dynasty as far back as 221 to 206 BC. 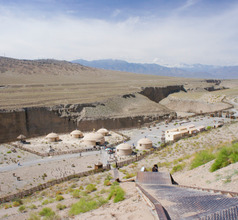 It was the main entry point into China from the West along the Ancient Silk Route. Its strategic location made it a busy commercial and trading zone between the 14th and 17th centuries during the Ming Dynasty reign. The city was a prosperous agricultural producer due to its fertile soil and water conditions. 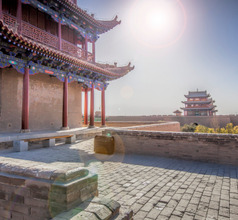 The modern-day Jiayuguan City is also a major business and commercial hub and this fact has been augmented further with China’s open-door policy introduced in recent years. Metallurgy, business, finance, hospitality, and tourism are the major industries in Jiayuguan today. The tourist-friendly environment and well-developed infrastructure have added to the appeal of the city as a tourist destination. 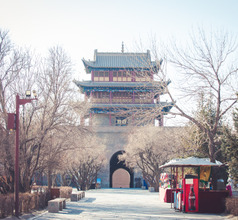 There is no shortage of accommodation in the city of Jiayuguan. From ancient times to date, the city has seen an immeasurable number of inbound traders, tourists, immigrants, etc. Over many centuries the city has evolved from an old-style tourist zone into a modern urban area with the best in hotel accommodation, infrastructure, and other tourist-related amenities. To stay in Jiayuguan City one can choose from 3, 4, 5-star hotels, budget hotels, and inns. The star hotels have in-house restaurants that provide International-style gourmet meals. The smaller hotels are conveniently located near fast food takeaways and public transport systems. Carrying an English-Chinese dictionary or downloading a translation app will be very helpful. 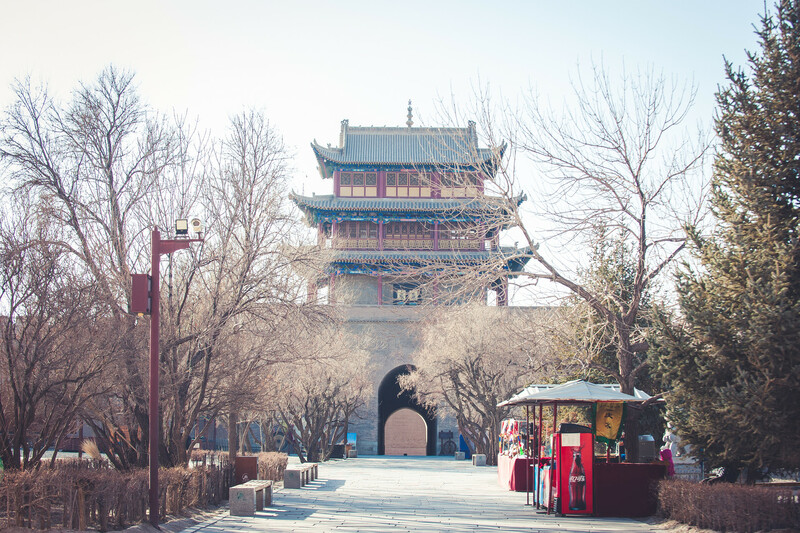 The city of Jiayuguan is steeped in history. It has several historical relics that have fortunately remained in a well-preserved condition. 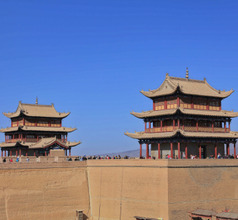 The most significant attraction is the Jiayuguan Pass which is better known as the Jiayuguan Fortress. 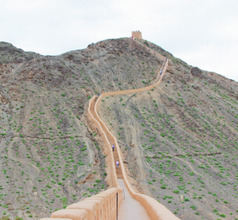 It is the first pass of the Great Wall that western traders had to cross before entering China. It is a magnificent structure and was considered impregnable in those days. Although it was built in 1372 during the Ming Dynasty era, it has remained in good condition and is definitely a must-see. 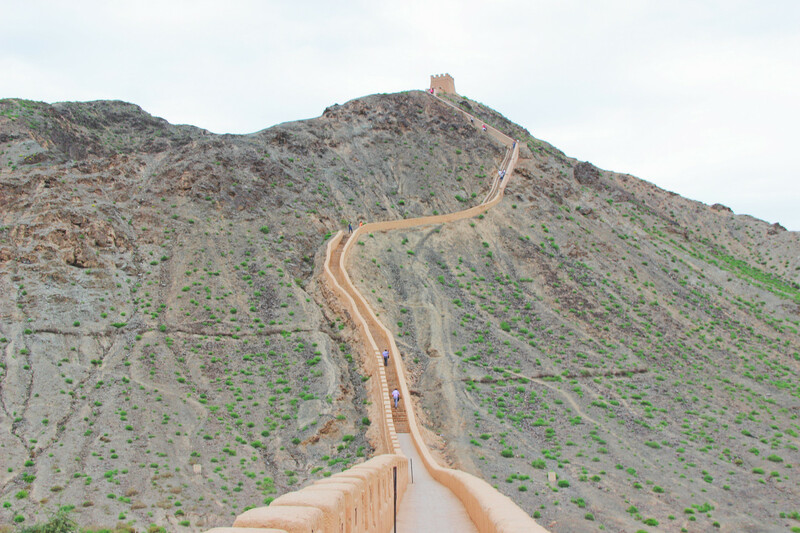 The Overhanging Great Wall in the northernmost part of the Pass is also a beautiful sight. Located about 7Kms from the Fortress is the magnificent Taolai River Beacon Tower. It is also called the First Beacon Tower of the Great Wall. 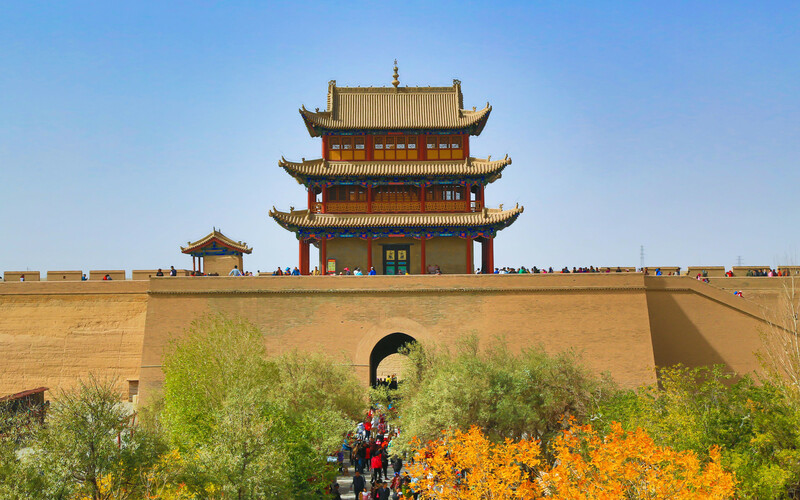 This too was built during the Ming Dynasty reign in 1539 and was considered a powerful additional defense system. From the top of the beacon tower, one can see 80 meters down into the valley so it had a lot of strategic significance. 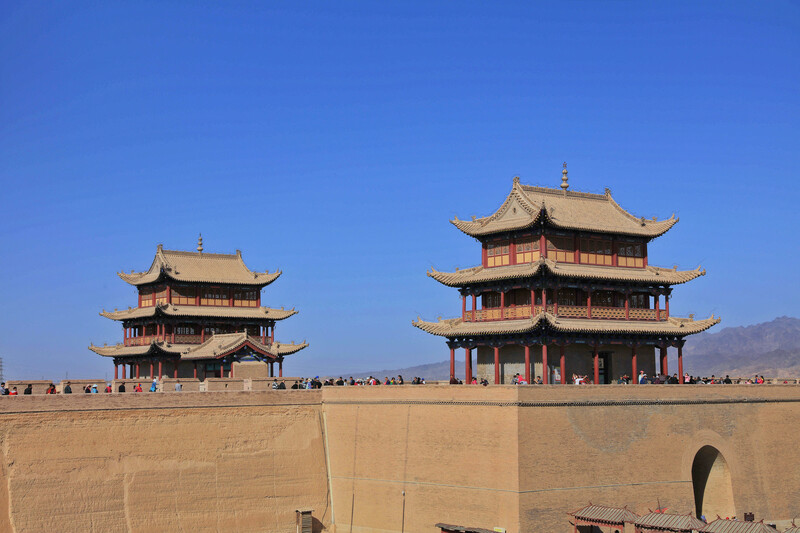 About 20Kms from Jiayuguan City is an unusual tourist attraction which definitely deserves a visit. Popularly known as JinWei Tombs, this attraction consists of 1,400 brick tombs of the Wei and Jin Dynasties which are scattered over a vast expanse of land. The tomb walls are decorated with vast and exquisitely painted murals that the site is referred to as an ancient art gallery and is also called the Weijin Tomb Murals. 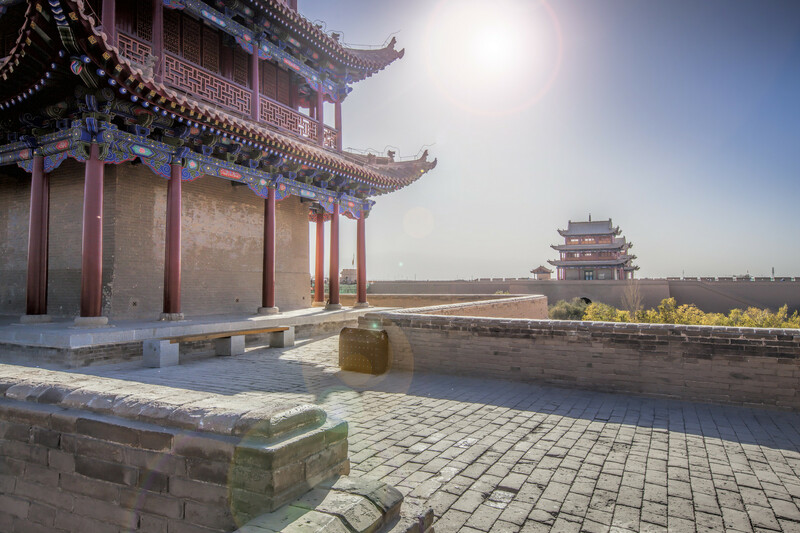 Other scenic tourist spots near the city of Jiayuguan are the Great Wall Museum, Heishan Cliff Paintings, Qiyi Glacier, and the Jiayuguan International Gliding Base. Undergoing upgradation, Jiayuguan Airport (formerly Jiuquan Airport) was opened once again in August 2006. It is 14 kms northeast of the city and can be reached by car in 25 minutes via Airport North road. Airport shuttle may operate during tourist season. 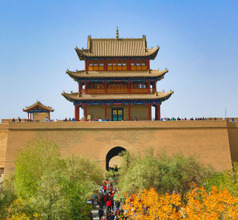 Most traffic goes to Lanzhou, Xi’an and Dunhuang with flights to Beijing, Shanghai, Guangzhou and Chengdu also offered. 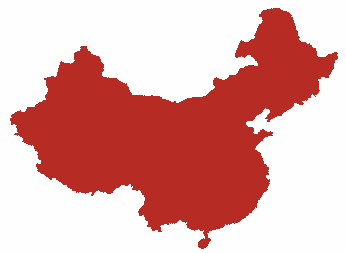 Dominant company is China Eastern Airlines with Air China, Shanghai and Sichuan Airlines also available. In Jiayuguan City, the local food belongs to the Dunhuang Cuisine where the dishes are still prepared in the same style as during the ancient Wei and Jin Dynasty eras. There are several restaurants serving Sichuan style spicy dishes like Lanzhou beef with noodles, spicy bean curd, or meat kebabs (barbequed meat on skewers). But to experience the true flavors of Jiayuguan one must visit the local restaurants and try out their twisted fish-shaped noodles, beef or mutton steamed with flour, trout, steamed fish with noodles, pulled noodles, wonton (dumpling) soup, etc. The dish called Silk Road Camel Palm made with the rare camel hoof tendon is a very expensive delicacy of the region.